Please click on a category to view our current inventory of replicas. Ordering instructions are on the Order Page. We also have a few New Items that are not yet listed in our catalog, but are available. If you do not see the specimen you are looking for, please contact us. 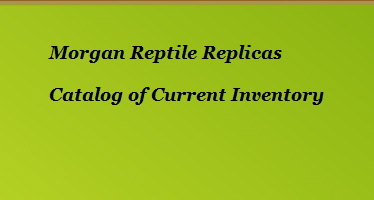 Custom replicas can be manufactured upon request if a model specimen can be obtained. Also, see our new line of fish, crustacean, bird and animal reproductions. Check Out Our Price List. Catalogs do not show pricing. Prices for products vary depending on the size of the specimen, the rarity of the specimen, and the difficulty of molding that particular specimen.